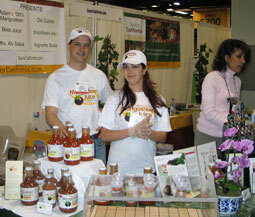 For one year only, the Winter Fancy Food Show was held in the beautiful, seaside city of San Diego. 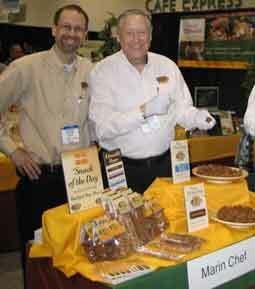 Steve and Bruce of Marin Chef were guaranteed to have fun, since CJ's Stix and CJ's Bitz were so popular at the show. The San Francisco Wine Competition has grown to become the largest and most prestigious competition for American wines in the world. Along with 40 gourmet food and beverage producers from Savor California, hundreds of medal-winning wines were served at this event which sold out, as usual. Erika Heinemann of Savvy Wine Foods explains the difference between her Seasoned Nuts for White Wine and her Seasoned Almonds for Red Wine at the 2008 Tasting. The world's largest natural, organic and healthy products trade show mirrors national trends toward healthier lifestyle choices. Adam's 100% Mangosteen Juice, Bela Organic Grape Juice, Mrs. A's Salsa Buena, Oat Cuisine Granola, SnackMasters Gourmet Jerky, and Vignette Wine Country Soda showcasied their products in the Savor California booth. Adam Heller and his assistant poured tastes of Adam's 100% Mangosteen Juice and Goji Juice. Hospice du Rhône is "the world's largest international celebration of Rhône variety wines," such as Syrah, Grenache, and Viognier. 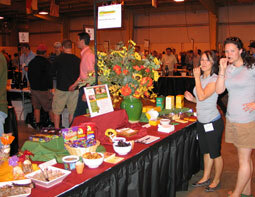 The Friday afternoon event was a preview of the wines to be offered in the Saturday auction. Gourmet foods, including from Savor California, were offered to pair with the wines. Participants included: Arlene's Toffee, B & R Farms, Savvy Wine Food, The Chocolate Traveler, The TeaRoom, and Valley Fig Growers. The best in the West was on display at this show on the beautiful grounds of the Sunset Magazine Headquarters. 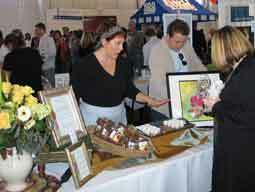 Companies from Savor California offered their gourmet food products for sampling and for sale. 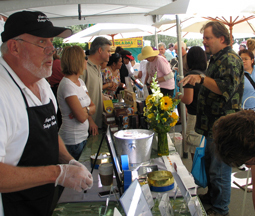 The crowd in 2008 was anxious to taste and purchase Gary Ponder's Napa Valley Fudge. 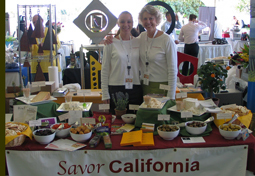 Savor California followed our success in 2007 and returned to the New York Fancy Food Show with: Choclatique, Elaine's Toffee, Golden Star Tea, Robert Lambert, Skipstone Olive Oil, Tennis Skirts Desserts, and Vignette Wine Country Soda. Robert Lambert won the Gold sofi Award for his Cherries in Merlot Syrup! 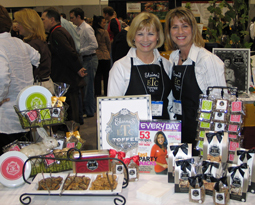 Janet Long and Anita Layng of Elaine's Toffee were part of the Savor California booth at both the San Diego and New York Fancy Food Shows in 2008. 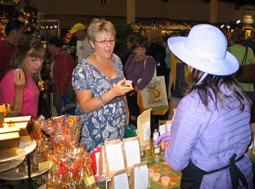 This event has a long history and draws attendance from the greater San Diego Area to shop for artisan products, including foods made by these Savor California businesses: 21 Missions Agave, Arlene's Toffee, Jade Chocolates, Little Sky Lavender Farm, SnackMasters Jerky, and Spindel Farms. Maria Maze offered samples of cookies made with her Little Sky Lavender Farm Lavender Cookie Mix, along with lavender lemonade, sweetened with her Lavender Sugar. The event featured internationally renowned, James Beard award-winning chef Rick Tramonto; Chef, author, restaurateur and tv personality David Rosengarten; Food Network stars The Hearty Boys; "Breakfast Queen" Ina Pinkney; the 'godfather' of Thai cuisine Tommy Tang; many other chefs and cookbook authors, as well as delectable products from SavorCalifornia.com. Megan Simpson and Jane St. Claire offered samples and information from: B & R Farms, Cypress Grove Chevre, La Bella Olives, Maisie Jane's California Sunshine Products, Meyenberg Goat Milk Cheddar, Pt. Reyes Farmstead Cheese, Santa Barbara Olive Company, Taylor Brothers Farms, Three Sisters Farmstead Cheese, Valley Fig Growers, and Valley Lahvosh Baking Company. Serious holiday shopping took place at the Pomona Harvest Festival. These Savor California companies offered their gourmet products for tastes and purchase: 21 Missions Agave, Arlene's Toffee, Art of Chipotle, Napa Valley Fudge, Spindel Farms, and The TeaRoom. 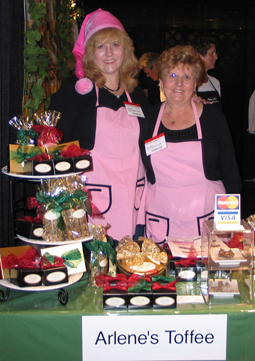 Devonne and Mollie were in the festive holiday spirit, serving Arlene's Toffee at the Harvest Festival in Pomona.